A space scientist and storyteller offers a dynamic workshop to help you weave tales out of this world. 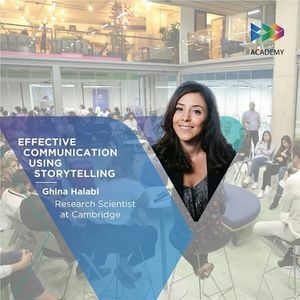 You will explore how storytelling can transform your work and amplify your impact through proven communication techniques. The workshop provides powerful narrative tools to stand out, own your story and harness its power to bring the change you want to see in the world. Ghina is a space scientist, storyteller, mentor and gender equality advocate. She works at the University of Cambridge and is a Research Fellow of Wolfson College. Ghina is the first person to obtain a PhD in Astrophysics from a Lebanese institution. After obtaining her doctorate from the American University of Beirut, she worked there as a lecturer before moving to Cambridge. She is a mentor, educator, published scholar and an invited speaker at international conferences including the United Nations and TEDx. Ghina recently founded Scheherazade Speaks Science, an award-winning social enterprise geared towards raising the visibility of women scientists by making science accessible and engaging with storytelling.